A high strength steel band saw, 20 mm wide by 0.80 mm thick, runs over pulleys 600 mm in diameter. What maximum flexural stress is developed? What minimum diameter pulleys can be used without exceeding a flexural stress of 400 MPa? Assume E = 200 GPa. In Prob. 319, determine the ratio of lengths b/a so that each material will be stressed to its permissible limit. What torque T is required? 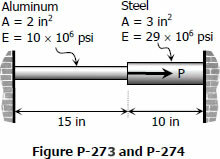 Four steel bars jointly support a mass of 15 Mg as shown in Fig. P-276. Each bar has a cross-sectional area of 600 mm2. Find the load carried by each bar after a temperature rise of 50°C. Assume α = 11.7 µm/(m·°C) and E = 200 GPa. A rigid horizontal bar of negligible mass is connected to two rods as shown in Fig. P-275. If the system is initially stress-free. Calculate the temperature change that will cause a tensile stress of 90 MPa in the brass rod. Assume that both rods are subjected to the change in temperature. At what temperature will the aluminum and steel segments in Prob. 273 have numerically equal stress? The composite bar shown in Fig. P-273 is firmly attached to unyielding supports. An axial force P = 50 kips is applied at 60°F. Compute the stress in each material at 120°F. Assume α = 6.5 × 10-6 in/(in·°F) for steel and 12.8 × 10-6 in/(in·°F) for aluminum.